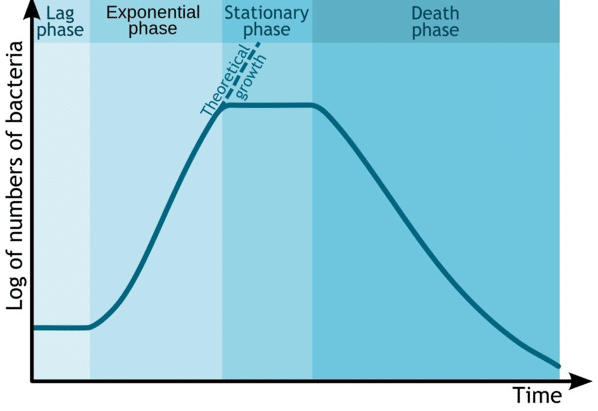 Let’s start by reviewing the 4 basic phases of a bacterial growth curve: log phase, lag phase, stationary phase, and death phase (Figure 1). A fresh inoculation of bacteria into media starts out in lag phase, where cells are metabolically active but not dividing. During this time, cells are adapting and adjusting to their new environment. The culture then enters log phase, where cells rapidly divide and double in number over a given period of time (E. coli can double every 20 minutes in log phase). When you reach a maximum cell density in a liquid culture, cells enter the stationary phase. During this phase there is no overall increase in the cell population – cells that die are replaced by newly dividing ones, but the overall number of live cells stays the same. If you’re working with spore-forming bacteria, this may be the stage where vegetative cells sporulate, or form new spores. And finally, the death (or decline) phase occurs due to a variety of factors, including lack of nutrition or oxygen, change in media pH as a result of cell metabolism, or accumulation of toxic cellular waste. The easiest way to gauge how far along a culture is in its growth curve is by measuring the OD600, or the optical density at 600 nm. This wavelength is specifically chosen for bacterial OD measurements because unlike UV wavelengths, 600 nm is not harmful to the culture. This wavelength is also not usually absorbed by yellow-ish medias like TSB and LB. By monitoring the rate of increase in OD600, you can identify the lag, log, and stationary phases of a culture. When you pull a culture sample, ensure that you’ve mixed it well and take the measurement right away, since cells can begin to settle within a minute or so, which leads to inaccurate results. If your bacteria form biofilms or aggregates in solution, this will severely affect the accuracy and precision of your measurement. In this situation, you might need to sonicate or further process the culture to break apart these ‘clumps’. Check the literature regarding the bacterial strain you are working with to avoid or negate this problem. Most importantly… An OD reading of >1 is not accurate! OD readings this high are beyond the dynamic range of most spectrophotometers, meaning that the readings do not increase linearly as cell concentration increases. If you do obtain an OD reading higher than 1, dilute your sample 2-fold or more until it reaches an OD600 < 1. If you work with flasks to grow bacteria on a regular basis, it’s helpful to train yourself to estimate OD by eye. This way, you can save valuable time by skipping OD600 checks when flasks are clearly not within the OD range you are looking for. Check out this article for more, and consider using a microplate reader to increase the throughput of your OD measurements. Though monitoring growth using a culture’s OD600 is a tried and true method, there are several other ways to assess growth and metabolism of bacterial cultures. You may find that some of these factors are more relevant or useful for your specific application, too! By taking samples of your culture and checking them out under a microscope, you can begin to get a sense of the approximate concentration of live cells in your culture. Bonus: you can compare images of cells to see if there are different morphologies from batch to batch, or how many vegetative cells are in a spore-forming culture. Dissolved oxygen and carbon dioxide. Consider beer (made from yeast), kombucha (made from yeast and various bacteria), and other enjoyable beverages fermented by microbes. As the fermentation progresses in these examples, oxygen (O2) is consumed and carbon dioxide (CO2) is formed. The same process happens in an aerobically growing bacterial culture! Dissolved O2 and CO2 probes are commonly used in bioreactors. If you want a less invasive option, optical sensors (and patches) exist that use LED fluorescence to monitor dissolved O­2 from the outside of a flask! pH. Most bacterial species lower the pH of their media over time, including coli. For some species, acid production can actually limit a culture’s maximum growth and viability. Like oxygen sensors, methods exist to continuously monitor pH noninvasively in flasks. Sugar analysis. With certain instruments, getting a fast and reliable measurement of residual sugars from your growth media is possible. For instance, if the primary carbon source in your media is glucose, obtaining a glucose measurement midway through bacterial growth can provide you a sense of where the culture is in the growth curve. So When SHOULD You Harvest a Culture? In short, it depends entirely on what the end goal is for the culture. For instance, I used to work extensively growing and inducing E. coli to overexpress non-native proteins, which would then be purified from culture. I often found that the quality and quantity of protein I obtained from the culture depended on the phase cells were in when I harvested them. In other cases, however, the goal is to simply harvest as many cells as possible. Once you know the specific growth phase at which you need to harvest cells, be sure to perform a couple of test runs (including measurements) to make sure you are correct in your assessment of the bacterial growth timing. This will give you a strong sense of how long it takes for your culture to be ready to harvest and provides historical data for comparing growth curves. Always start from a smaller ‘seed’ culture to get reliable and consistent growth in flasks. Finally, test your cell culturing techniques a few times if you are not quite comfortable to reduce the risk of contamination. From the relatively simple OD measurement to metabolite analysis, there are a plethora of ways to keep tabs on your growing bugs in the lab. Since growth stage impacts much within a culture, knowing how to accurately measure this parameter is a key technique in any bacterial lab! Do you have any tips for OD measurements or bacterial growth monitoring? Tell us in the comments below! If you are measuring a hazardous species such as Mycobacterium tuberculosis, you can buy little cuvette caps to keep things contained when you bring the samples out to measure. Otherwise use Parafilm to seal the tops. Another option is to buy a small little battery-powered spectrophotometer and just keep it inside the BSC.